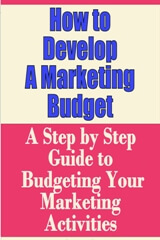 This guide will walk you step by step through all the essential phases of developing a results driven marketing budget. Product - The item or service you have to sell. Price - The amount of money you ask your customer to pay for your product. Place - Where a product is now and how it is transported to your customer. Promotion - The advertising and publicity neces sary to complete a transaction. Persuasion - Personal selling of your business. Each of the five Ps represents an investment in money, materials and services. We can represent this as a system of pipes consisting of a tank of money, which represents the total marketing budget, a main pipe through which the dollars flow and five valves that control the flow of money to each of the five Ps. The concepts of market planning, segmentation and positioning are shown as filters. Budgeting is the process of setting the valves to meet the needs of each marketing task for each segment and then monitoring the results over time to make sure you remain on target. As your market segments change, you will have to reset the valves. What is a description of our product or service? What image does it have in the market? In the eyes of the consumer, is there a way for us to provide our product or service more effectively? Where does our product or service fit in a product life cycle? Introduction (maximum investment in development). Marketing decision - At some point during this declining stage, you must decide whether to invest more money in the product (i.e., create a new and improved model requiring additional investment and generating a new life cycle) or to discontinue it. There are a number of pricing strategies you can use to achieve your growth goal. Each has the potential of producing a profit, and most are tied to the critical relationship of price-to-sales volume and stock turnover. Some strategies you may want to consider are listed below. The product is unique and people are willing to pay extra just to have it. There are trendsetters in society who always are looking for something new and are willing to pay the price. A larger number are followers, and they will buy your product if it is accepted by the leaders. The followers, however, will not pay the higher price. The cost of development is high and there is a chance of early obsolescence or imitation by competitors. You have a strong patent position, or your product would be difficult to copy. The real disadvantage of skimming is that it attracts competition. Your competitors will soon figure out what you are up to, and the high profit potential will encourage them to copy you. They may produce cheaper versions of your product or style, referred to as knockoffs in the market. Once you have meaningful competition on price, your skimming days are over and you run the risk of ending up with a warehouse full of products that cannot be sold at any price. The opposite of skimming is to introduce your product at such a low price that you will quickly gain a large share of the market. The purpose is to discourage competition. However, eventually you will have to raise your prices to start making some profit and, when you do, you will learn much about customer loyalty. A variation of penetration pricing is to buy your way into the market with free samples or heavy coupons, for example, 50 cents off on a 69-cent purchase. This tactic is usually used by big companies because it takes considerable financial backing and it may be six months or more before it starts to pay off. Small marketers can use it to the degree they know what they are doing and can control the process. Frequent follow-up is important to ensure samples are not going to professional collectors but are reaching potentially strong customers. This refers to promoting a few items at a sizable reduction to attract customers. The idea is that the increased traffic will result in greater sales of your regular-priced merchandise. The reductions have to be on recognized brands and items purchased frequently enough so customers know the prices and can recognize the savings. You must keep switching leader items - people are not going to buy catsup four weeks in a row regardless of its price. The danger is that you may develop a following of cherry pickers who will breeze into your store, scoop up the specials and buy nothing else. You can increase the size of your individual sales by offering a meaningful discount for larger purchases. A liquor store usually will offer a discount or throw in a free bottle of wine when you buy a case. The same idea applies to the "baker's dozen," a discount on a "set" of tires or selling beer and soft drinks by the pitcher. This is a good technique for building customer goodwill, but you will not see your customers as often. The trade-off, of course, is that you save time and money on containers and packaging, save time by writing up fewer sales and, perhaps, can make your delivery service more efficient by selling by the truckload. Variations are "two-fors," "six-packs," "cheaper by the carton" and "bulk price." This is the practice of selling at prices set by your suppliers. It is convenient because many product lines are available prepackaged and prepriced. However, you lose flexibility and must live with a set percentage markup. (To combat this disadvantage, some suppliers offer "two-for-three" options using the retail price). Because suggested-retail or retail-price-maintenance plans are illegal in some states, the practice usually is a loser. Using a slightly different strategy, Panasonic published a "minimum retail" price list showing a higher "average retail"; some stores use such gimmicks as "compare at" or "nationally advertised at" to imply that the "official" price is at a certain point. The discount store usually offers lower prices as a trade-off for spartan interiors, lack of sales help and the efficiency of central checkouts. These stores typically work on a 35 to 38 percent markup compared to 42.5 to 45 percent for a department store. Since discount stores depend on the efficiency of greater volume to cover operating costs, they must maintain, or at least promote, good prices. This pricing is calculated by adding the costs of the product or service plus a flat fee or percentage as the margin of profit. During inflation, you must keep track of your costs to make sure that you are charging enough. In many business lines, owners have come to realize that when they replace their stock, the wholesale price has often risen above their retail price. If they do not raise prices rapidly enough, they are faced with diminishing inventories at a constant dollar investment or with having to invest more money to restock their shelves at the constant level. This refers to the practice of setting the retail price at double the cost figure, or a 100 percent markup. It is most common with jewelry items and in specialty shops, high-ticket fashion shops and department stores. Typically, the merchandise is subject to drastic clearance markdowns on items that are slow sellers or held past the season. This is the technique used by most retail stores of stocking merchandise in several different price ranges. A hardware store, for example, may carry hammers in good, better, and best categories at $6.49, $12.49 and $19.98, respectively, and a professional model at $27.95. The theory is that people buy products with different uses in mind and with different expectations for quality and length of useful life. If you do not carry a range of prices, you may lose the customers who cannot find the product at the right price. Price lining simplifies buying and inventory control because you buy only for the price levels that you know your customers will accept and eliminate those goods that fall outside the levels you want to carry. Here is where you copy or follow the prices set by your competition. Based on your service image, you can set your prices equal to, above or below those of your competition. This strategy requires constant vigilance by reading the ads and shopping your competition. It is a more passive technique because you're always following your competitors. Chances are your more aggressive competitor can make better purchases than you. A variation of this is the we-won't-be-undersold routine, where you offer to meet or beat the prices of all your competitors. Many manufacturers offer price discounts or dated billing as incentives to buy early. This is important to manufacturers because of production planning and the lead time necessary for ordering raw materials. For the retailer, the same principles apply; also, off-season specials may be a way to profit in business on a year-round basis. When you sell at a lower price to get the early sales, you may be borrowing from later full price sales. On the other hand, anyone who has tried to buy snow tires during the year's first snowstorm knows the extent of delivery problems. In this case, early sales at a lower price would have allowed the merchant to serve the customers better and to capture sales that may be lost due to limited service facilities. This refers to certain marketing situations in which the quality of the product or service is far more important than the price. If you need a kidney transplant, for example, you are not going to shop around and haggle over price. And even if you do press the doctor, he probably will quote you a range with a $5,000 spread rather than giving a specific number. The same is often true with high ticket fashions and jewelry. Using the same psychology, expensive automobiles and boats are not sold on price. They may use a starting at or base price to get people interested, but the prices of the options are usually in very small print. The extreme of this attitude is that if you have to ask the price you probably cannot afford the item anyway.